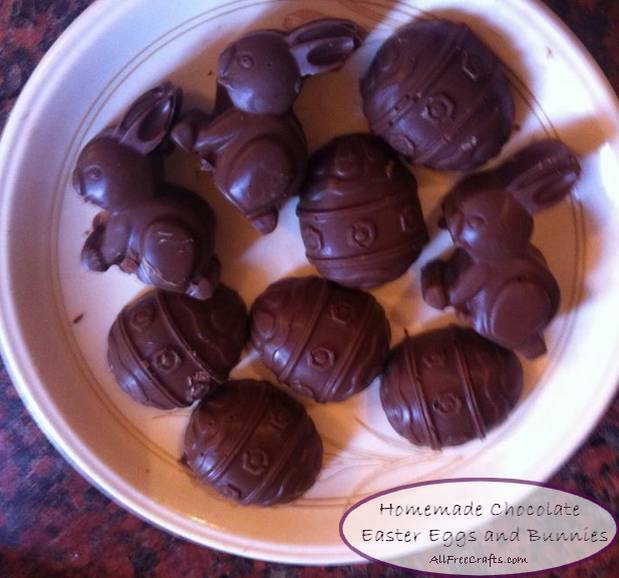 Easy homemade chocolate Easter eggs and bunnies. 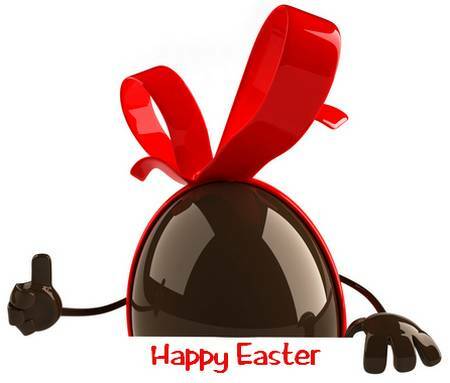 Have some fun with your kids, before Easter arrives, with homemade solid chocolate Easter eggs, Easter bunnies, or chocolate Easter theme treats. Easter Theme Mold (or Mould, in the U.K.): As soon as the discount shops and grocery stores move out their St. Patrick’s Day merchandise, they bring in the Easter stuff – including an array of chocolate and candy making molds. Grab a shallow one meant to make solid Easter eggs, bunnies or other Easter shapes. Chocolate: Also grab some chocolate. This could be ordinary chocolate bars that you can melt down; bars or chunks of baking or candy-making chocolate; candy melts, which are widely available in in North America; and dark or white chocolate chips. 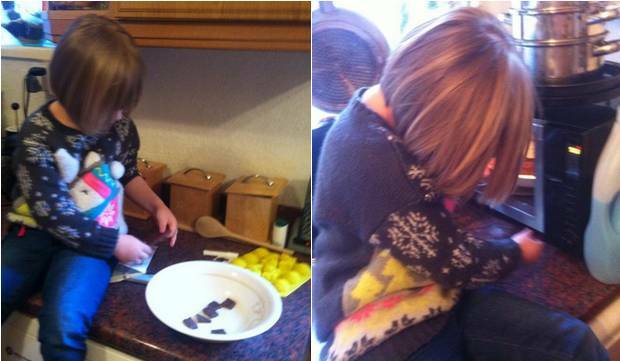 Sophie breaks up chunks of chocolate and lays them on a dish ready for the microwave. If you want to melt your chocolate in the microwave, do it in quick 20 or 30 second increments, checking progress after each stage. 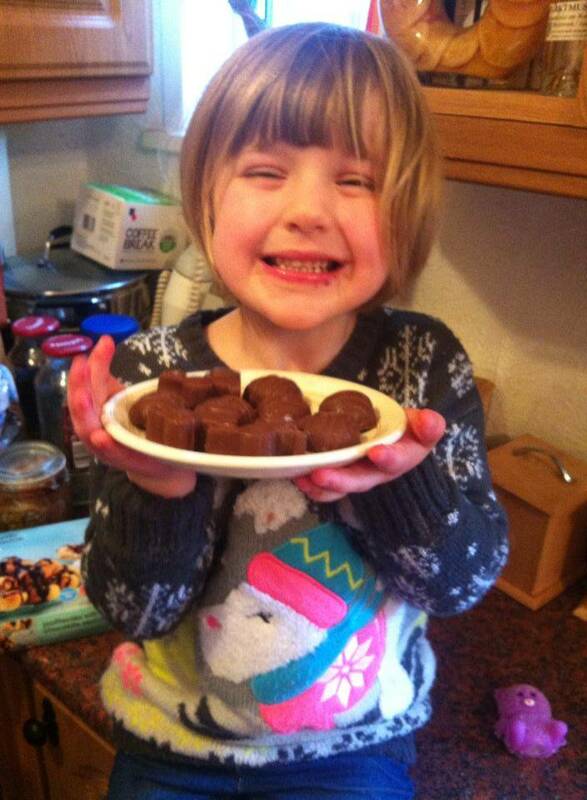 Chocolate goes from melted to thick and lumpy in the microwave very quickly, so start off slowly, and pay attention. Remove from the microwave as soon as the chocolate has reached a soft melt. You can also melt chocolate in a double boiler or over a saucepan of boiling water. Bring water to the boil, then turn off the heat. Add chunks of chocolate to the upper portion of the double boiler; or to a plate or shallow dish suspended over a saucepan of freshly boiled water. Stir the chocolate until melted. 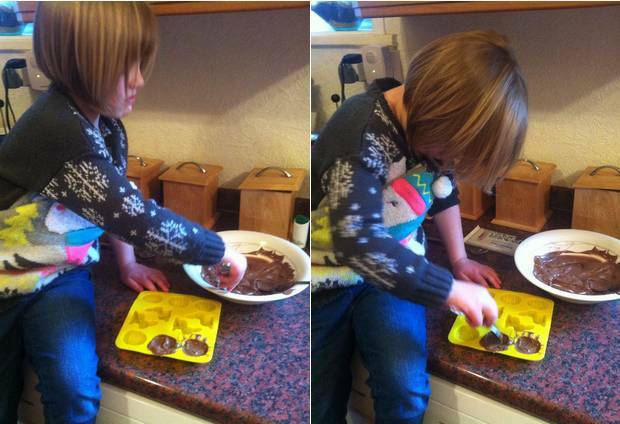 Sophie demonstrates how to fill the Easter molds with melted chocolate. Spoon melted chocolate into each cavity in the mold. If your chocolate starts to harden and becomes difficult to work with, pop it back in the microwave for a few seconds to liquify again. Flatten the top of each shape with the back of a spoon. Put the chocolate-filled mold into the refrigerator until cool. 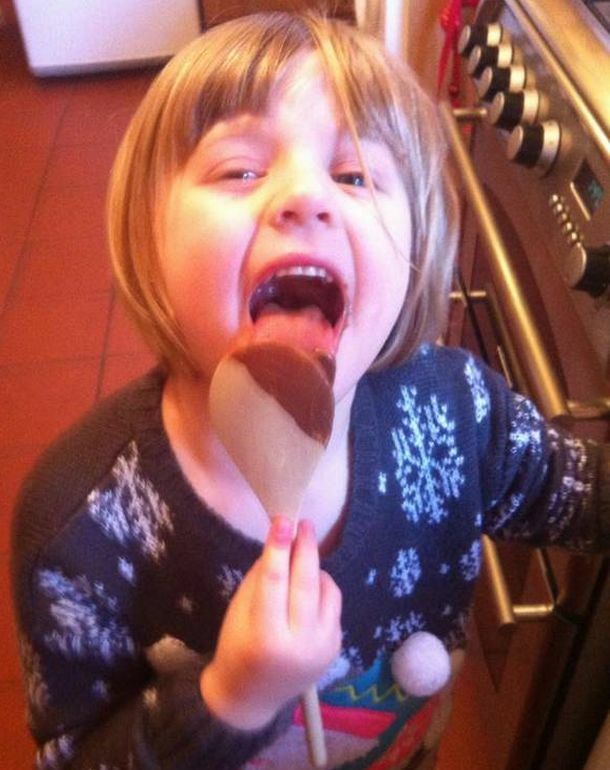 Of course, the hard-working cook gets to lick the spoon when all the hard work is done. Once the chocolate has hardened, turn the mold upside down over a plate. Press gently on the back of the molds, or hold the sides and twist it a little bit, to loosen the chocolate eggs and bunnies. They should fall out quite easily. and bunnies for your whole family to enjoy! Arrange the Easter goodies on a plate. Present with a flourish and a smile.